After the shattering death of his beloved wife, aging baby-boomer Russell Walker had wanted only to hide from the world in the woods of British Columbia. Instead, an old college acquaintance called Smelly, who was a telepath, had knocked on his door and demanded his help in stopping a serial killer who made Hannibal Lector look like a boy scout. They had managed to convince Nika, a hard-headed and skeptical police officer, and the trio had stopped the killer, though nearly at the cost of their own lives, and things could go back to normal...they thought. But then Russell was visited by his estranged son, Jesse, a PR exec from New York, still angry over his father's role in his mother's death. And, to their dismay, Nika and Russell learn that agreeing to help Zudie conceal the fact that he can read minds involves committing to help him hide from the CIA, who have been hunting him desperately ever since he escaped from the MK Ultra Project back in the 60s. Constable Nika must decide what being a peace officer means. Russell must decide on the fly whether or not Smelly is the kind of friend you'd die for. And Jesse, who lives in America, must decide just where his own national -- and personal -- loyalties lie. 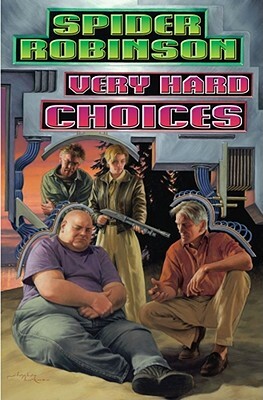 Best-selling and award-winning author of The Martian Child David Gerrold says of Very Hard Choices, "Spider Robinson is at his best when he is most passionate -- and this is Spider Robinson at his very best. If you're expecting a nice polite distraction that you can put down and forget, you're going to be very annoyed. This isn't a story, it's a wake-up call. And it isn't over until you decide it's over.